Filmed in two separate parts by Terence Davies, Distant Voices, Still Lives explores his childhood and early adulthood in the Liverpool of the 1940s and 1950s through the characters of Tony (Dean Williams), his authoritarian father Tommy (Pete Postlethwaite), loving mother (Freda Dowie) and lively sisters Eileen (Angela Walsh) and Maisie (Lorraine Ashbourne). 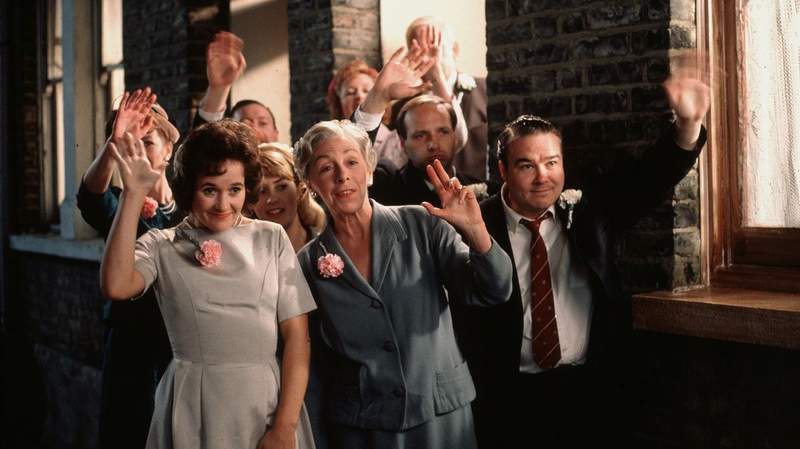 Told in a non-linear fashion, the first half of the film – Distant Voices – begins with the family preparing for Eileen’s wedding, but recollections of Tommy are quickly woven in as his absence at the ceremony is felt, and soon the past is dominating proceedings. While some of the memories are warmly nostalgic – Tommy lovingly filling his sleeping childrens’ stockings at Christmas – most are more brutal, as the patriarch insults and beats his wives and daughters, and the terrified family shelter from the Blitz. The second half – Still Lives – which focuses on Eileen and Maisie’s married lives – is more conventional and less compelling in terms of both substance and style. Distant Voices contains some of the most beautiful, poetic filmmaking in British cinema. In the way it seamlessly flits between events separated by large stretches of time, Davies seems to have miraculously captured the essence of memory itself in its elliptical, dreamlike quality. Moments aren’t necessarily remembered in the order they happened, while what connects them is mysterious yet somehow intelligible at the same time. It is the cinematic equivalent of the stream-of-consciousness recollection associated in literature with the works of Proust and Virginia Woolf. It is Davies’ mastery of the cinematic form – justly rewarded with the International Critics Prize at Cannes in 1988 – which achieves this effect. Though there is plenty of movement and dancing in the film, characters’ recollections are typically framed within perfectly set compositions that evoke photography and the precise moments in time it captures. Then there are the mesmerising fades and transitions that transport the viewer almost unnoticeably from past to the present, and back again. Colours are unsaturated to represent memory’s vagueness, and the actors deliver their lines with a self-consciousness that reminds one this is reality remembered, not reality itself. Music, with its intrinsic power to evoke the past, also has an important role to play. Songs by classic crooners saturate the soundtrack, although not always in the sentimental way one might expect, with one painfully memorable scene in particular juxtaposing Ella Fitzgerald’s Taking A Chance With Love – ‘Starry eyed again/Taking a chance on love’ – with Tommy mercilessly beating his wife. In Still Lives by contrast, which is centred on a gathering at a pub to celebrate the birth of Maisie’s baby, it is the women on-screen who do the singing, which in its sheer quantity gradually becomes tiresome. As one critic commented at the time: “In the pub sing-songs there are enough pop numbers to qualify the film as a musical”. While Davies has explained that this is true to his experiences at the time, it is unclear whether modern audiences will be quite so appreciative. Fortunately, there is much else to appreciate about this film.